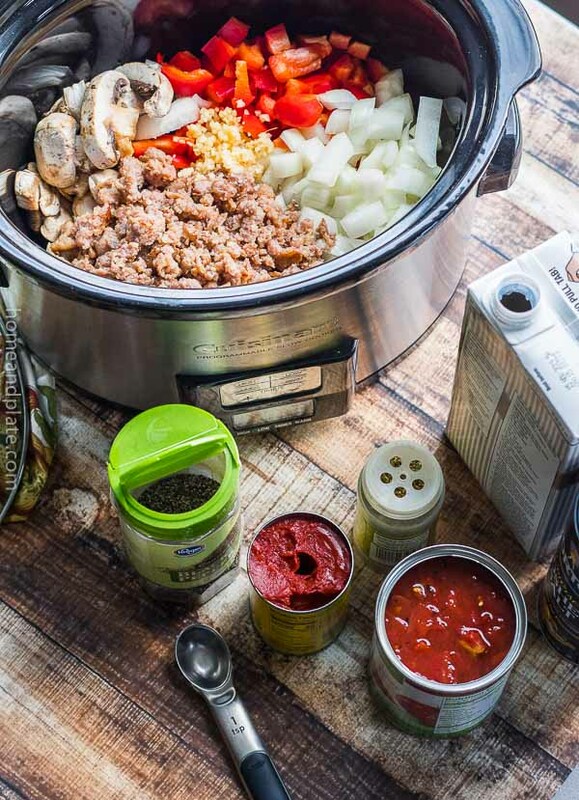 Your favorite lasagna is now an easy slow cooker soup recipe. This winter favorite features layers of noodles, spicy sausage, homemade marinara loaded with onion and mushrooms and topped with creamy mozzarella and ricotta cheeses. 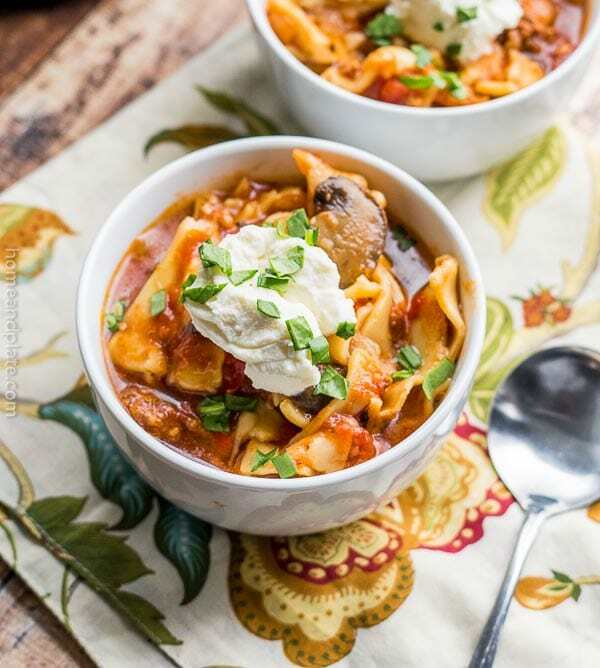 This lasagna soup recipe is everything you can imagine in one bowl. It’s easy to prep. Easy to cook. After all, your crockpot does all the hard work. It’s finally getting cold in Ohio and it’s darker earlier. When dinner time rolls around I need something easy to serve. And sometimes soup is the answer. But this is no ordinary soup recipe. It’s comforting… it’s hearty… and it feeds crowd. 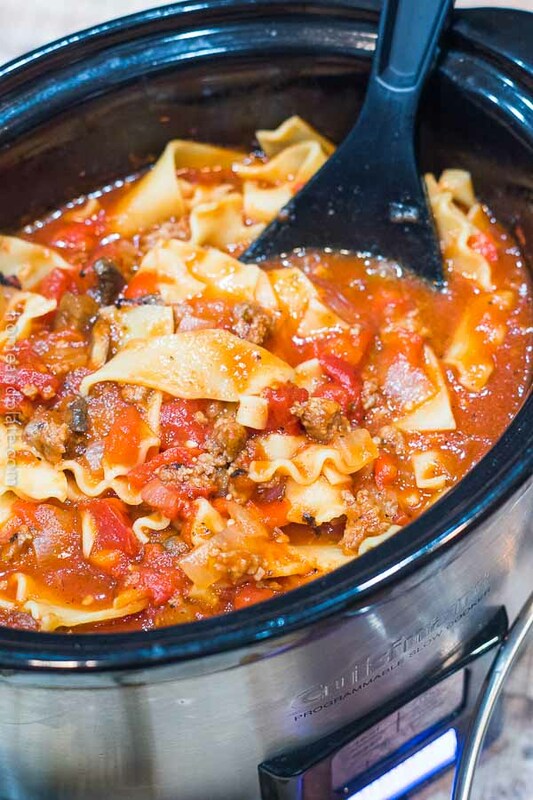 This slow cooker lasagna soup has all the essentials of traditional lasagna. The hardest part about this recipe is browning the sausage. Once you’ve done that the rest is dump and go. The lasagna noodles and cheeses go in after six hours of slow cooking. 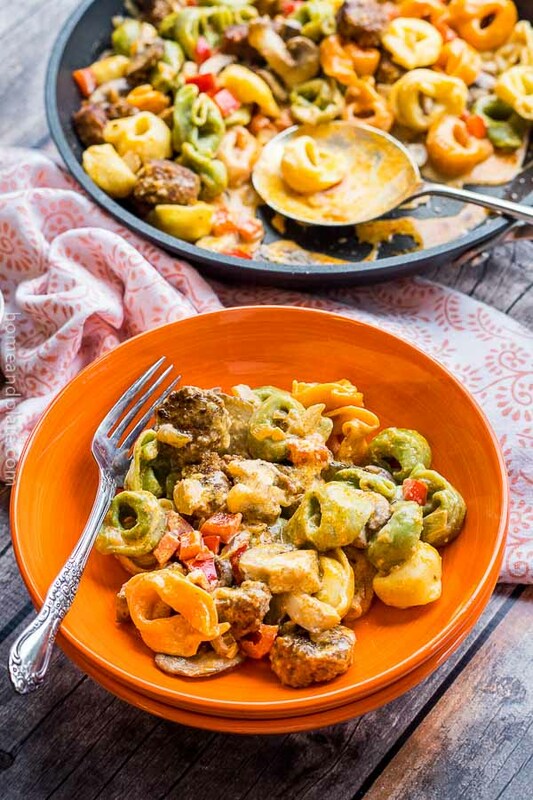 The ingredients can be tweaked if you would prefer ground beef or chicken. If you are not a fan of mushrooms, add in spinach or chopped zucchini. The lasagna noodles will take a half an hour submerged in the crockpot to reach al dente. Any longer and your noodles will start to absorb the broth. It’s an easy fix. Just add more broth to your liking. Brown the sausage over medium heat for five minutes. Drain the grease and transfer the cooked sausage to a crock pot. Add the onion, red pepper, tomatoes, tomato paste, chicken broth, Salt pepper and oregano and slow cook covered on low heat for six hours. Submerge the broken lasagna noodles into the soup. Cover and cook until the noodles are just cooked, 30 minutes longer. Garnish each bowl of lasagna soup with ricotta and mozzarella cheeses and fresh basil. 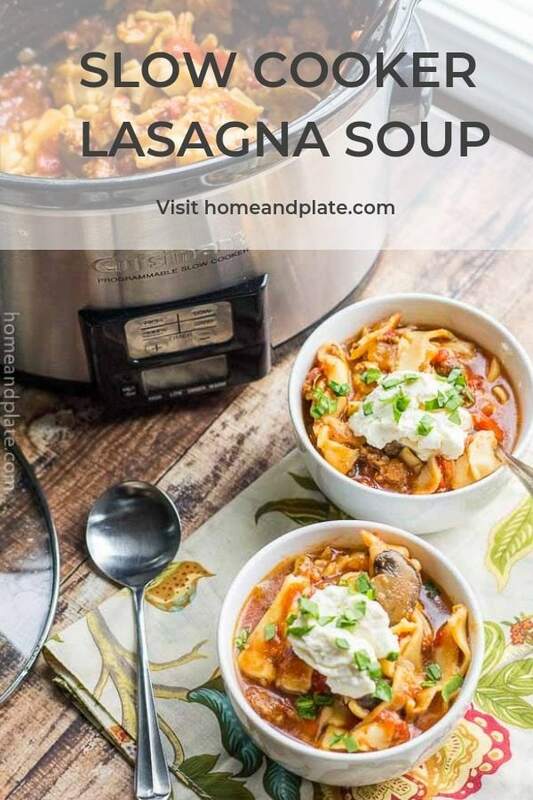 "description": "Your favorite lasagna is now an easy slow cooker soup recipe. 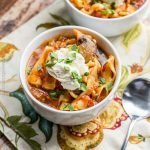 ", "recipeIngredient": [ "1 pound hot Italian sausage", "8 ounces mushrooms, chopped", "1 medium onion, chopped", "1 red bell pepper, chopped", "2 teaspoons minced garlic", "1 (14-ounce) can chopped fire roasted tomatoes", "1 (6-ounce) can tomato paste", "32 ounces chicken broth", "2 teaspoons dried oregano", "8 ounces lasagna noodles, broken into pieces ", "Salt and pepper to taste", "Ricotta cheese, for garnish", "Mozzarella cheese, for garnish", "Fresh basil, for garnish" ], "recipeInstructions": "Brown the sausage over medium heat for five minutes. Drain The grease and transfer the cooked sausage to a crockpot. 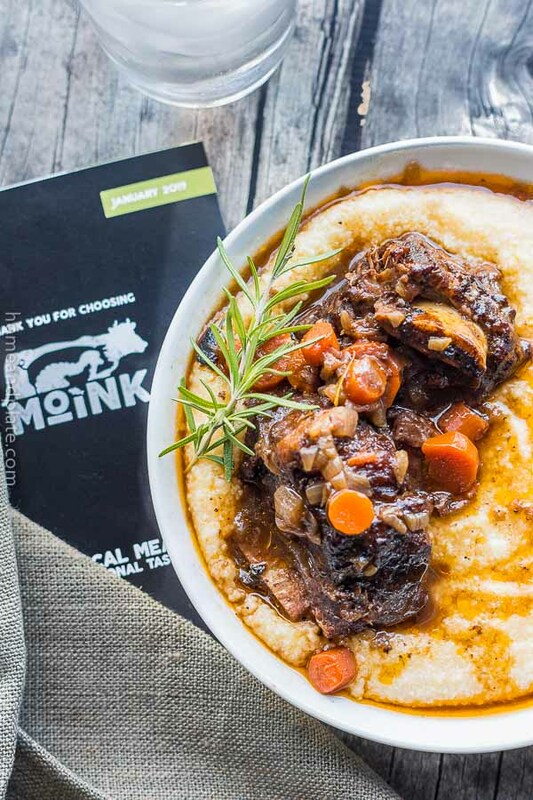 This looks so comforting and perfect for the winter days we’ve been having lately! With this polar vortex here in Ohio it’s the best dinner for a snowy cold night. This looks and sounds absolutely Fabulous! I could eat it all day. Thanks Andrea… it definitely makes enough for a second helping. 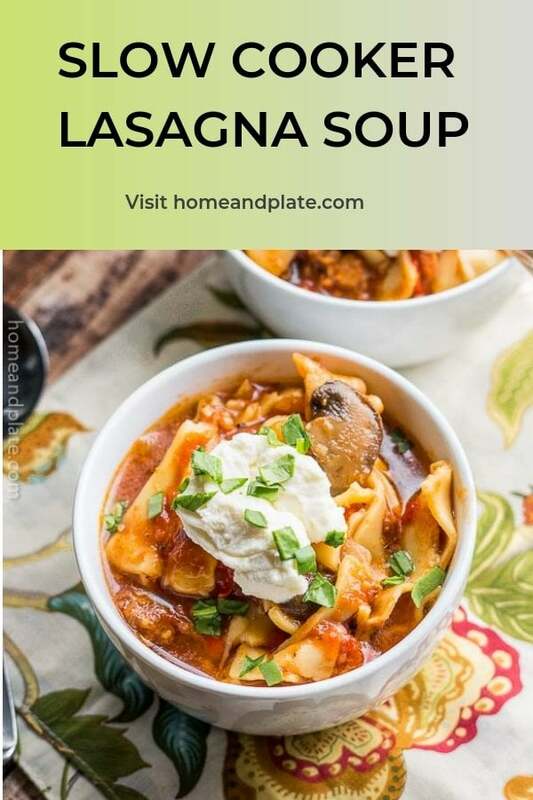 I love making lasagna but have never tried a lasagna soup. Sounds delicious. Def want to try it! I love lasagna, but it really is time consuming. This is the perfect solution to getting the taste without the time investment. Mmm… this sounds like the perfect dinner especially when it’s cold outside. Hearty and warming!